BSNL provides Limited & Unlimited usage Broadband Internet Plans for Home / Business Customers at lowest fixed monthly charges with Free Landline Connection in both Rural & Urban areas across India. As compared to all other broadband service providers in India, the tariff plans offered by BSNL are very cheap and affordable to ordinary people. BSNL Landline Broadband offers High Speed Internet Connectivity from 2 Mbps to 24 Mbps whereas BSNL Fiber Broadband (FTTH) offer ultra fast download speed up to 100 Mbps. BSNL provides a wide variety of postpaid broadband plans / offers which include - Unlimited Usage Broadband Plans, Special Fiber Broadband Plans, High Speed VDSL Boradband Plans, Limited Usage Plans, Broadband Only Plans, Flexi Combo Broadband Plans, Rural Broadband Plans etc. BSNL already upgraded the minimum download speed of all broadband plans to 4Mbps for all plans with monthly rental of Rs 675/- on wards. Why should I apply / subscribe to BSNL Broadband ? *Unlimited Free Night Calls (9pm to 7am) to Any network in India. *Unlimited Free Calls on All Sundays to Any network in India. 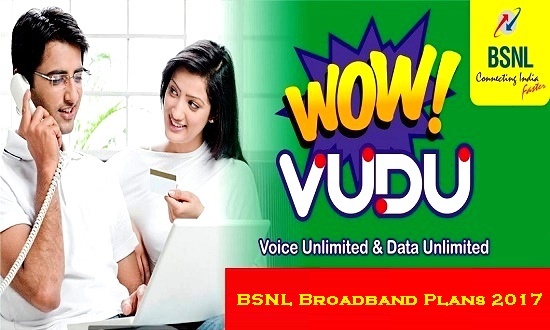 *For new customers, Unlimited Broadband available @ just Rs 249/- per month for One Year. *Minimum initial download speed of 4 Mbps for all plans from Rs 675/- on wards. *Minimum 1 Mbps download speed after FUP quota in all Unlimited Broadband Plans. *Speed Top Up option to restore high speed even after FUP quota. 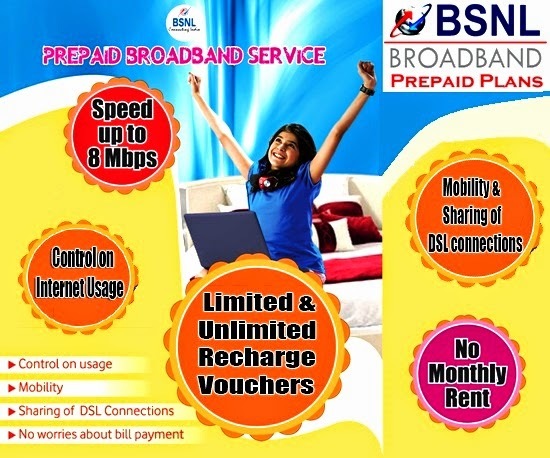 Recently, BSNL revised the plan migration period of its promotional Unlimited Broadband plan - Experience Unlimited BB249, from six months to One year for all existing and new customers in all the circles. Now customers may enjoy the most economical Unlimited Broadband Offer from BSNL, by paying just Rs 249/- per month for One Year. However, the plan is only available to new broadband customers till 30th June 2017. Customers shall pay their telephone bills through BSNL Online Bill Payment Portal, which is the most easiest, secure and convenient way for payment of bills for Landline (includes Broadband), FTTH (Fiber Broadband) and WiMax Connections. BSNL) offers Prepaid Broadband Services for it's customers across India. The main attractions of Prepaid Broadband Service are the Mobility, No Fixed Monthly Charges, Control on Internet Charges and Sharing of DSL connections etc. Prepaid Broadband Customers can use their Broadband account in any city in the Country (except Delhi and Mumbai) on most of the Broadband enabled connections of BSNL. A group of prepaid Broadband customers like students, professionals can share a single DSL connection also. BSNL offers Prepaid Broadband Plans having high download speed / bandwidth for it's customers. There are different types of Prepaid Broadband Plans which offer Limited and Unlimited download options, which are the most attractive and cheapest plans for Home and Business Broadband users. BSNL Prepaid Broadband Plans for Home & Business customers starts with a minimum broadband recharge amount of Rs 200 (BBV RL 200) and maximum of Rs. 3000(BBV RL 3000) from 256 Kbps to 8 Mbps high download speed accordingly. Customers may also use Prepaid Broadband TOP UP facility also at any time. Modem charges: For outright purchase, ADSL Basic Modem costs Rs. 1400/- and ADSL WiFi Modem costs Rs. 1800/- with Inclusive of Taxes. Installation charges and Modem charges shall be collected in advance through the local commercial system at the time of application for Prepaid BB connection. In case of customer having his/her own modem, only Installation charges shall be collected in advance through Demand Note through the local commercial system at the time of application for Prepaid BB connection. Top up vouchers of the shall be available for additional data usage without any change in validity Validity and Top Up Voucher shall not be applicable to those using unlimited usage. An email id with 5 MB mail space shall be given in bsnl.in domain. Broadband Internet customers of Home & Business who subscribes with any of the above BSNL Prepaid Broadband Plans can also subscribe to BSNL Postpaid Broadband Services.